Each month I pull together a list of cake ideas and flavors, and then pick out my favorites to make! I’m always asking you guys what cake I should make next, and I love your suggestions. A recurring suggestion I’ve received is for a mint chocolate cake. When I think of mint and chocolate, all I think of is mint chocolate chip ice cream. I’m not sure if that’s where everyone else’s mind goes, but it is the inspiration for this cake! As I came up with the concept, I knew I wanted to include mini chocolate chips, and definitely some chopped up chocolate in the decoration! I went back and forth quite a bit trying to decided whether the cake should be made with chocolate or mint cake layers. 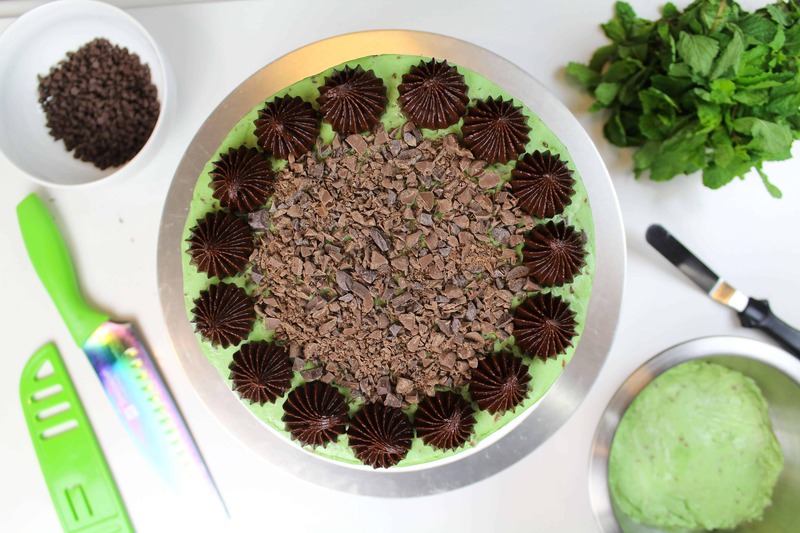 I decided to pick mint cake layers, so that the mini chocolate chips I added to the batter would be visible. 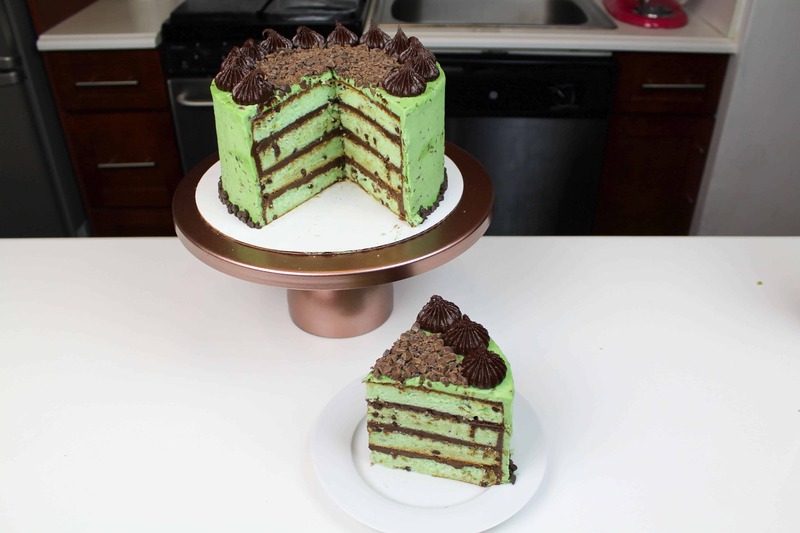 Since I went with mint cake layers, it made sense to fill this cake a milk chocolate ganache. Begin by making the ganache filling. It needs a few hours to set, so I highly recommend making it first, or even the day before! To make it, place both the milk chocolate (1125 grams – about 3 bags of chocolate chips) and heavy cream (375 grams) in a heat proof bowl, and heat for 30 second increments (stirring between). Usually after about 2 minutes of heat, all the chocolate is melted. Once the mixture is fully incorporated, place plastic wrap over the top of the ganache, and let it sit overnight (or at least a few hours). 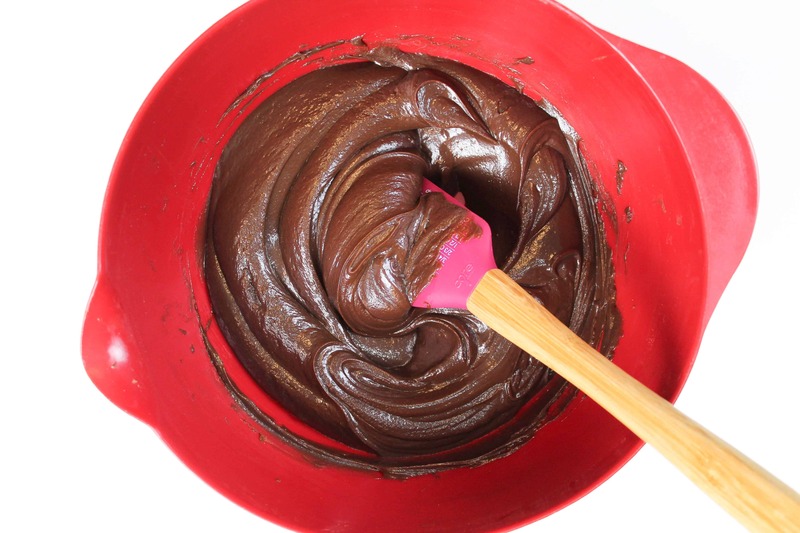 Before adding the room temperature ganache to a cake, give it a slow stir with a spatula to ensure it’s nice and smooth, and the right consistency. 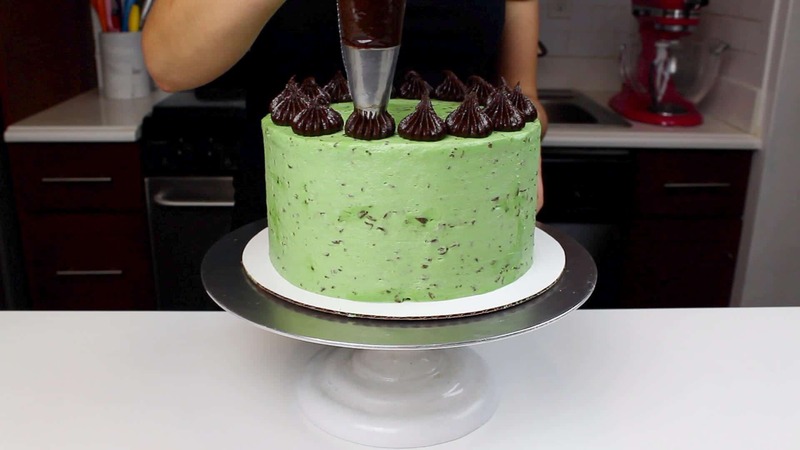 Next, prepare the the cake layers and buttercream, as directed in the above recipes, and adding the mint extract, green gel food coloring, and chocolate at the end of the process. 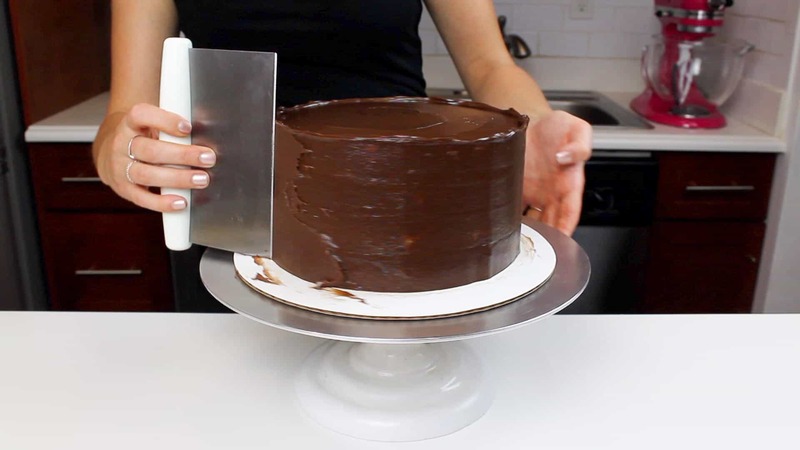 Make 4, 8-inch cake layers. I also trimmed away the caramelization once they layers had fully cooled, using a serrated knife! This is totally optional, but I feel like it helps the pastel green shade of the cake really stand out! Once the layers are fully cooled, begin to stack them, spreading an even layer of ganache over each layer. 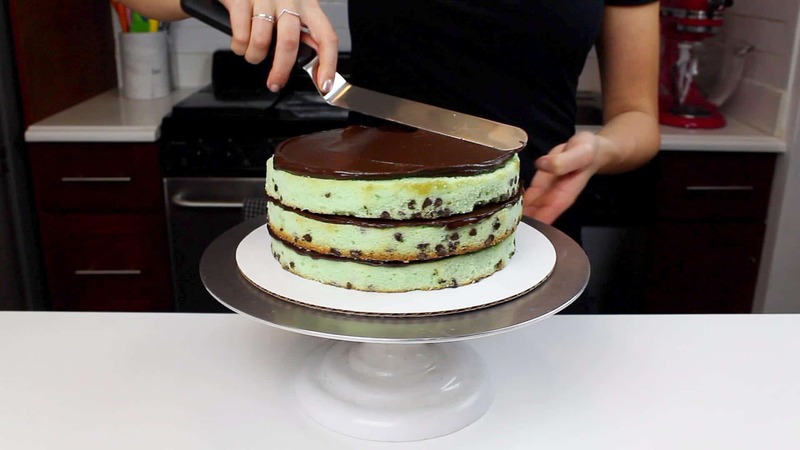 Next, cover the cake in a thick layer of the mint chip buttercream. It’s important that you use enough buttercream, so that the chocolate ganache doesn’t show through the frosting. Smooth using an offset spatula and bench scraper. Be very careful as you smooth, as the chocolate bits in the buttercream can drag and ruin your perfectly smooth sides! 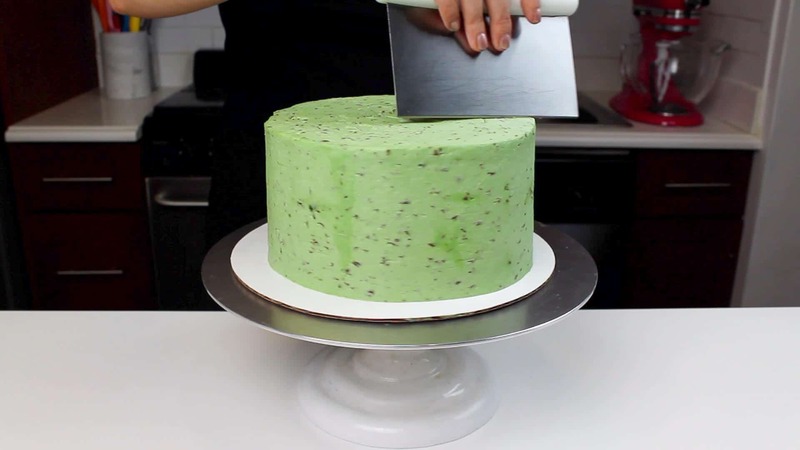 As you smooth, try to hold the bench scrapper at a more parallel than perpendicular angle to the cake, to allow the chocolate pieces to be gently pressed into the frosting, rather than dragged along the sides. You can see a full tutorial on how to frost a cake with smooth sides here. Pipe a ganache boarder around the top of the cake, using the remaining ganache. Once piped, add the chopped chocolate bits onto the top of the cake. Use the back of a spoon to gently press then onto the frosting, to help them stay in place. If desired, you can also add mini chocolate chips to the base of the cake! Use a small offset spatula to gently press them in to the frosting. Then you just need a color-coordinated knife to cut into this cake!! 😛 Totally kidding, but I really do love when one of my knives matches the color theme of a cake. I’ve been really into this iridescent knife, and figured it was perfect for this cake.